This next card features the Cuttlebug Pearls Technique from the upcoming October issue of the TJNL. I love the antique look of the embossing folder, with the shimmer of the pearls showing through. 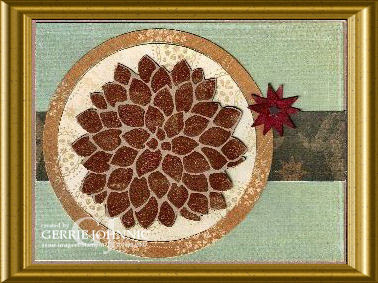 Joining me as a guest challenge player this week is Gerrie Johnnic - here's her "Fabulous Flower" embossed card. Isn't that a clever use of the star punch! Be sure to check out the other Bloggers Challenge Players Blogs located on my side bar - I'm sure they will inspire you to get out your embossing items! If you'd like to play along with this weeks challenge, be sure to leave a link to your blog in this post! You are just too sweet! I am so honored that you used my layout! Your card is so cool...that technique is just perfect for those leaves. REally captures the spirit of the season! I also can't wait for the new newsletter..that looks like a super technique, too! Gerrie! Come and play every week! I love your creations!!! Ooooooh, lovely!!! Really like the cuttlebug pearls effect! I'm loving the cuttlebug pearls effect!! Can't wait to see how that one is done - gorgeous!! Your other card and Gerrie's are awesome too!! Great job!! Awesome cards Lisa. My favorite is the cuttlebug pears one. I can't wait for the new TJ newsletter now! Lisa, ALL of these cards are just gorgeous. Of course I love the TJ ones -- even though I am biased it would be hard not to! Lisa, these are all lovely! Love seeing all the different ways to emboss! That is something I don't do often enough! Sure makes your cards POP!!! Thanks for sharing! WOW! Love BOTH your cards and Gerri's, too! Can't wait to try the Cuttlebug Pearls, too! The Cuttlebug Pearls is awesome, it's absolutely stunning! Great cards this week! Oh my gosh, I have just got to get to Illinois and stamp with you!!! Wow, Lisa, these are just stunning, they must be unbelieveable IRL. Excellent work as always. Oh the leaf one is so breathtaking!! Love this. These are all beautiful. I especially like the embossed leaves. All 3 cards are beautiful! 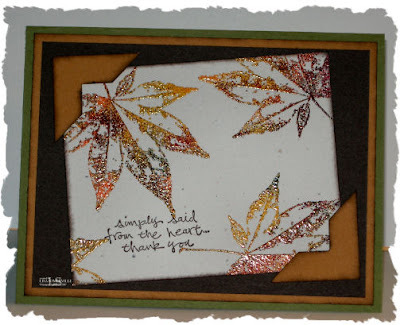 I really like the abstract embossing--perfect with the leaves. All the cards are gorgeous!!!!! The Leaves card looks SO rich!!! How cool! I haven't seen those techniques before! Great samples Lisa! I love the fall colors on the leaves from the abstract embossing technique. Gorgeous variations on the challenge - they are beautiful. 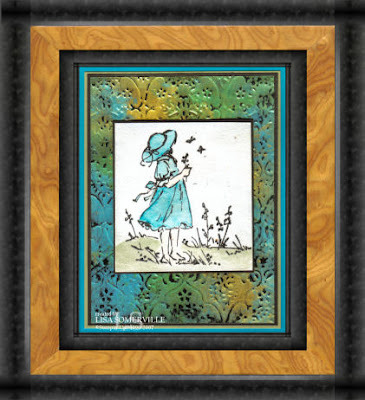 As always Gerrie's work is stunning! !